The Golden Oyster caps are golden to bright yellow, 2 - 5 cm , convex to plane at maturity, often depressed in the center. Stems white, centrally attached to the caps. Usually growing in large clusters arising from a single, joined base. 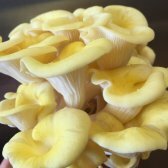 Taste, shelf live and culinaric use are simmilar to the Tree Oyster mushroom.